APCO v. Nissen - CUT UNNECESSARY REGULATORY BURDEN, Inc. This is the classic “David versus Goliath” battle -- a privately owned $16.5B corporate monopoly with unlimited financial resources seizes private property so it can profit and control how that property is used. Our fundamental Property Rights are under assault by the Federal Energy Regulatory Commission (FERC) and its licensee American Electric Power and we need help! 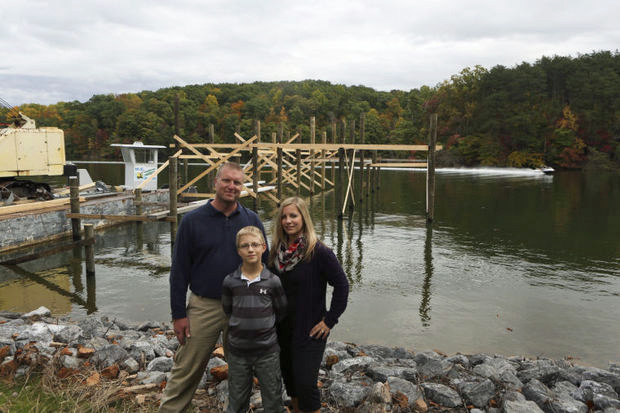 AEP’s “crack” legal team is suing this local family for building a dock without AEP’s permission -- but this family does not need AEP’s permission, their recorded Deeds give them the right to build their personal dock on Smith Mountain Lake. More so, AEP's flowage easement allows all lake front property owners the right to access the waters for recreational purposes ... or at least it did until 2003 when AEP and FERC decided they could unilaterally change the rules. AEP’s legal maneuvering, should it prevail, will relegate all shoreline property owners to the status of a licensee under AEP’s total and indiscriminate control. This violates every citizen’s fundamental right against property seizure. When government takes private property for public use, that government must pay "just compensation" to the property owner. A private corporation has zero right to take private property for its use without that landowner’s agreement. According to the United States Court of Appeals for the District of Columbia,federal lawmakers cannot give regulatory authority to a private entity. To do so would be “legislative delegation in its most obnoxious form.” The US Constitution, Section 1, Article 1 grants no regulatory power to a privately owned power company, even if it is regulated monopoly. Yet AEP insists its Federal License responsibilities trump every landowner’s property rights and the law of the land! When selling lakefront property, how does a seller convey his Occupancy and Use Permit to the buyer? The seller contacts Appalachian (esbrennan@aep.com) to request a status report of the project boundary and any permits issued for the property in question. Appalachian staff researches its records, conducts a site visit if necessary and conveys its findings in writing to the seller. Upon compliance with any permits issued and a satisfactory inspection Appalachian will state in writing that, as of that day and barring no modifications, Appalachian can execute the Assignment of Permit. If the structure is not in compliance with the permit issued or other violations are detected, additional information will be conveyed to the property owner on the actions necessary to obtain compliance. Does Appalachian charge a fee for a permit? Appalachian’s license from the Federal Energy Regulatory Commission allows it to charge a reasonable fee to cover the costs of administering the permit program. A study is being conducted to assess what fees are appropriate. This is everyone’s fight because the outcome of the litigation AEP/APCO initiated will affect the property rights of all lake front owners. Our community must advance a united front to vigorously defend our rights as Virginians to enjoy and use our property, consistent with recorded property rights and the laws of our Commonwealth.